SACRAMENTO — As Lakers rookie point guard D’Angelo Russell stood on the basketball court, Lakers coach Byron Scott stared at him with amusement and offered him a challenge. Scott issued a $150 bet that Russell could not bank on a corner 3-pointer. Moments later, Russell proved Scott wrong, though the Lakers’ coach insisted Russell did not agree to the terms before making the shot. The Lakers are banking that Russell will shed his summer league, training camp and early-season struggles. They also became intrigued with Russell’s playmaking and confidence during pre-draft workouts. But Scott also revealed that Lakers general manager Mitch Kupchak and executive Jim Buss partly drafted Russell because of other external circumstances. 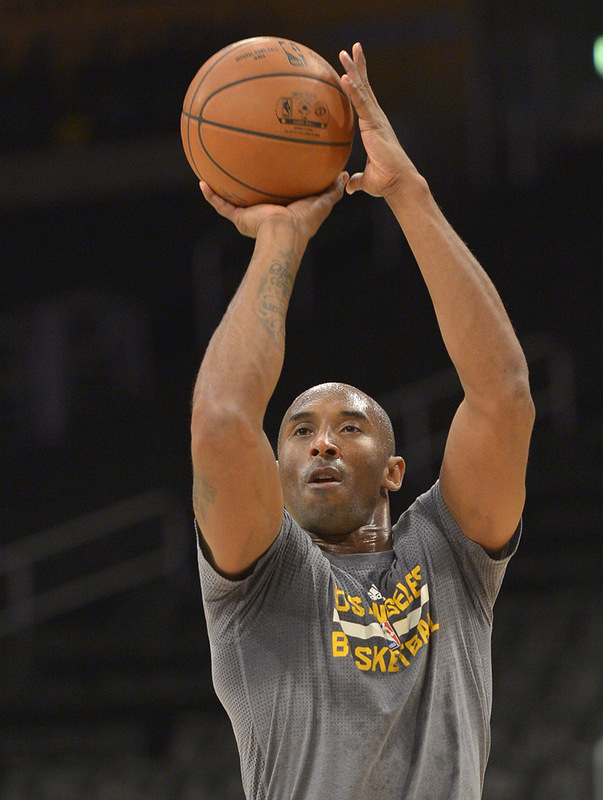 SACRAMENTO — Kobe Bryant missed the Lakers’ morning shootaround on Friday, but it hardly elicited concerns about the 37-year-old’s durability. He simply had a sore throat. That hardly compares to what Bryant experienced in recent years, including season-ending injuries to his left Achilles tendon (April 2013), left knee (Dec. 2013) and right shoulder (Jan. 2015). 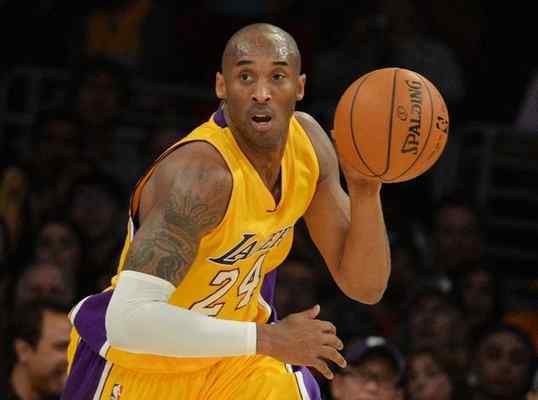 How will Kobe Bryant fare in his 20th NBA season? Well before Minnesota forward Kevin Garnett darted his piercing eyes and directed his loud mouth at Lakers second-year forward Julius Randle, Kobe Bryant already knew it was coming. 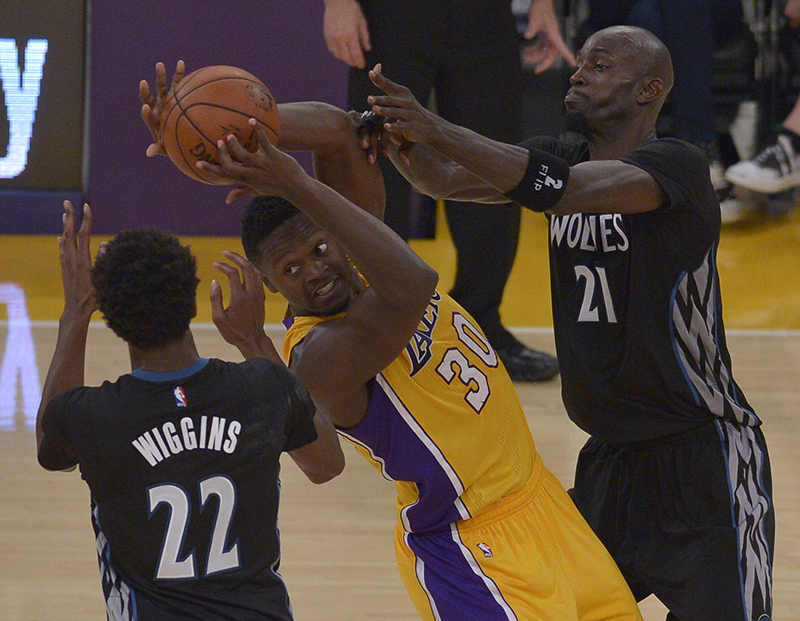 It turns out that Randle is made of a lot in the Lakers’ 112-111 season-opening loss to the Minnesota Timberwolves on Wednesday at Staples Center. Randle refused to shy away from Garnett. Randle talked back. Shortly after Garnett picked up a technical foul with 3:14 left in the second quarter, Randle inbounded the ball off of Garnett’s back without the 21-year-old NBA veteran looking. Rarely will Lakers coach Byron Scott question Kobe Bryant on much. Scott has admired Bryant’s work ethic ever since mentoring him his rookie season. Scott often defended Bryant’s high-volume shooting last season both because of his talent and lack of supporting cast. But Scott has taken issue with Bryant going 3-of-13 from three-point range in the Lakers’ 112-111 season-opening loss to the Minnesota Timberwolves on Wednesday at Staples Center. 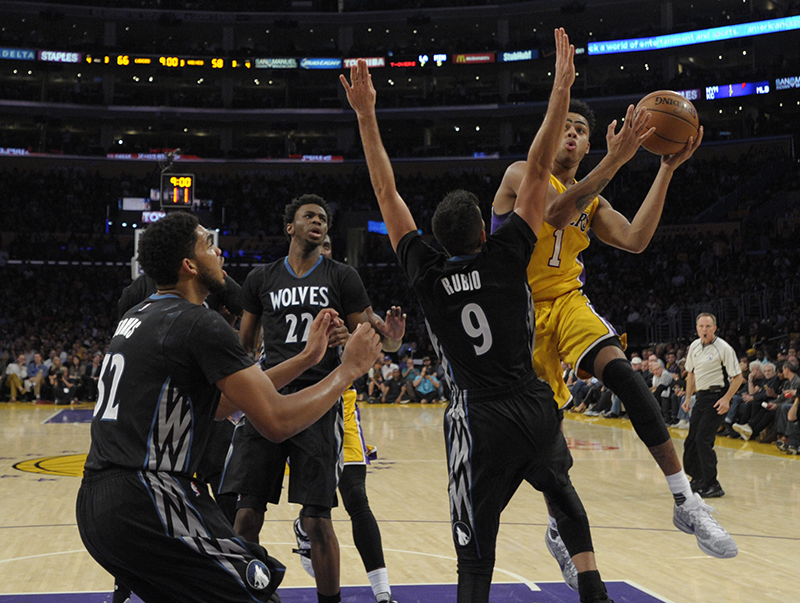 Scott also said it was a “little too much” for the Lakers to go 9-of-35 from the perimeter. 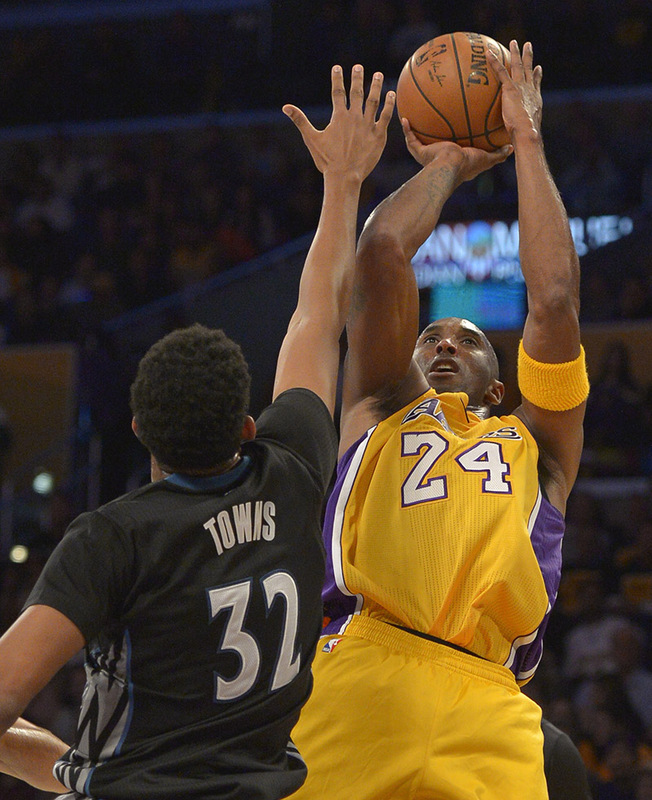 Scott ideally wants his team to take about 20 to 25 3-pointers per game, but what about Bryant? The five men convened at half-court. Lakers coach Byron Scott and guard Kobe Bryant began talking. Lakers rookie guard D’Angelo Russell, second-year guard Jordan Clarkson and second-year forward Julius Randle listened intently. All of which presumably entailed something they had discussed earlier in Wednesday’s practice. Scott’s experiment to feature Russell as an off-ball guard will become a one-hit wonder. Russell will start point guard and assume ball-handling duties when the Lakers (0-1) visit the Sacramento Kings (0-1) on Friday at Sleep Train Arena. After slightly turning his head, Lakers forward Julius Randle saw an imposing figure that remains consumed with physically and verbally taunting his opponents. That man also represents one of Randle’s childhood idols. But instead of the second-year player cowering under Garnett’s intimidation, Randle did something else. 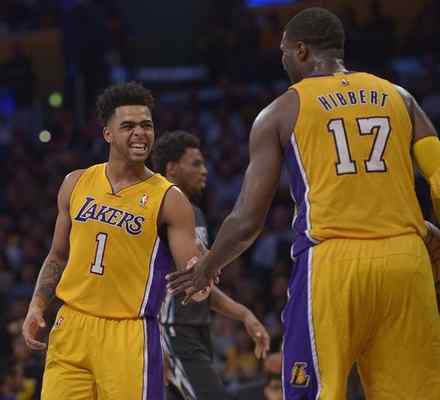 Randle confronted the Minnesota Timberwolves forward and chirped back. Garnett was then soon called for a technical foul. Randle maintained Garnett is “laughing more” because of the Lakers’ 112-111 loss to Minnesota on Wednesday at Staples Center than their exchange with 3:14 left in the second quarter. But Randle could also express amusement about Garnett’s tough tactics, namely because they didn’t work. Lakers coach Byron Scott knew the question was coming. He smiled. And for what has seemed to be the millionth time since training camp started, Scott offered the same answer? Can you say how many minutes Kobe Bryant will play in the 2015-16 season? Bryant averaged 34.5 minutes per game last season through 35 contests before suffering a season-ending right shoulder injury. Scott became self critical of himself both before and after Bryant’s injury, saying that he overestimated Bryant’s ability to overcome a left Achilles and left knee injury that kept him out in the 2013-14 season for all but six games. Scott appears unlikely to make any grand announcement on how he will limit Bryant’s playing time in hopes to keep him healthy for his 20th and perhaps final NBA season. Bryant has missed the past three exhibition games because of a bruise in his lower left leg. But after phasing Bryant back into practice in the past week, Scott plans to start Bryant without restrictions in the Lakers’ season opener against Minnesota on Wednesday at Staples Center. “Tonight might give you a pretty good indication,” Scott said, smiling.